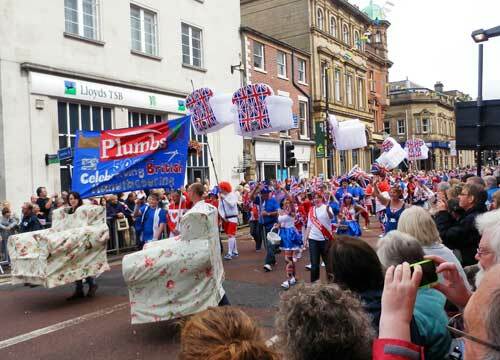 Preston Guild 2012 was a great success. It's hard to know where to begin as it could just become a very long list. A summary might be that the organisation was excellent, the events were high quality, the range of events showed great imagination, it was very well attended by a well natured, happy crowd and the weather was especially kind. Like the Olympics it left a sense of emptiness when it ended. What a relief the weather looks decent. Arriving at Preston station at 9am Preston Harriers were waiting outside the Fishergate Centre, wonder why? 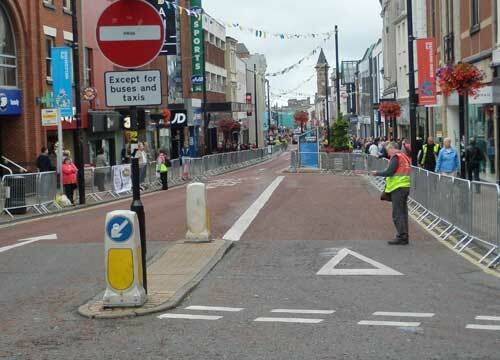 Fishergate was being fenced for the route and people were already sitting in the seats they'd brought to get a good view. Wandered round Winckley Square looking at the food stalls being put up and then onto the Flag Market for the 3rd Guild Proclamation. A big grandstand in the middle of market meant we had to stand at the side but there was a big screen in Harris Street. Around 10am a few were arriving on the Harris steps overlooking the square and just before 10.30 the proclamation began with a good sized audience. The highlight of the proclamation for me was standing in an audience exuberantly singing the National Anthem which I can't recall doing before, it nearly got me. That Bobby Charlton feeling. The mayor spoke well and the Guild Clerks speech needed saying. The Mayors constant referral to Preston party town in a flat tone was quietly amusing, maybe Peter Kaye can announce the party next time. Why were Preston Harriers at the station? They were waiting for the Guild Friendship Scrolls to arrive by train. 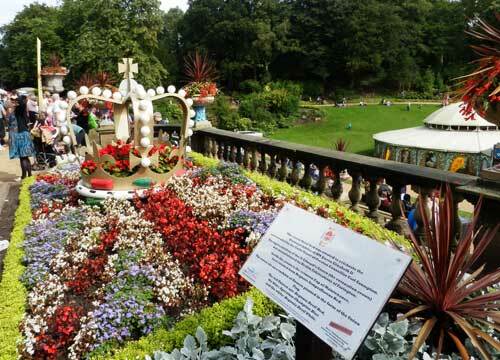 These scrolls have been all over the world and signed by Prestonians and well wishers living overseas. 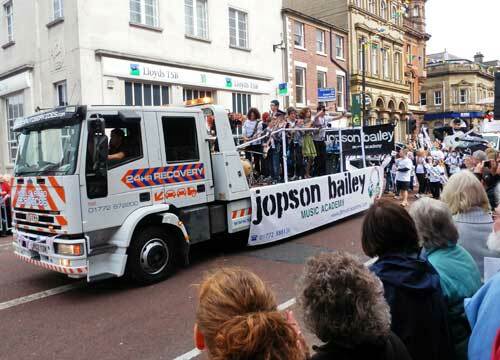 A relay of Preston Harrier members including Helen Clitheroe, Olympic Athlete, carried them from the station to the Mayor. Olympic enthusiasm swallowed us all. 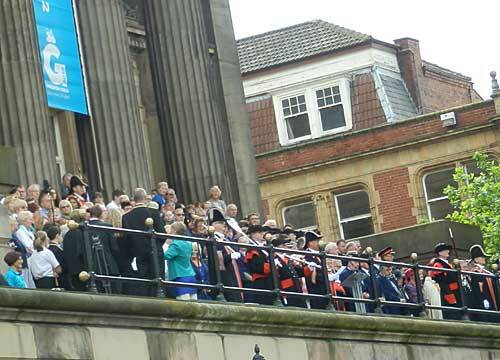 Photo of the Preston Guild 3rd Proclamation at the Harris Museum and Art Gallery overlooking the Flag Market. So off for a bit of refreshment and a bite before choosing a spot for the Trade Procession. Around mid-day took a spot opposite Fox Street. 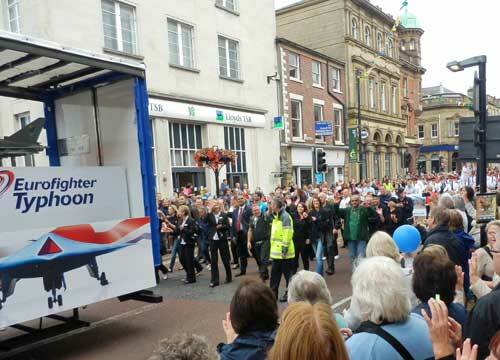 Big and good natured crowd with a character close by who had a big line in banter for every marcher who could hear. Pride of place at the front of the procession was BAE Systems who had made sure their name was all over the Guild and deservedly so, after over 70 years in this area designing and building the RAF's most advanced aircraft. Photo of the BAE Systems float containing a Typhoon front fuselage and models. 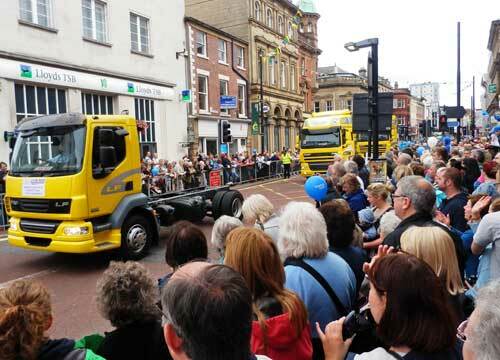 Going out of order we have Leyland Trucks who brought 3 trucks to the procession and a display in Miller Park. 'Designed and built by Leyland Trucks here in Lancashire' it says on the front of the trucks keeping the 100 years of Leyland vehicle manufacturing alive. 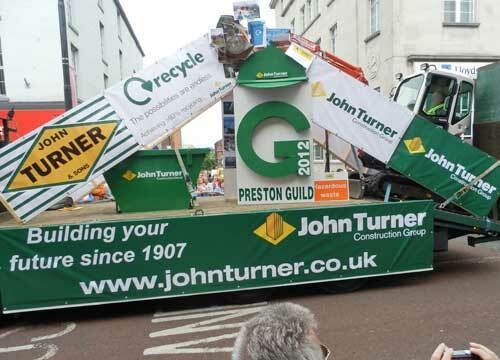 John Turner Construction were close to the front of the Trade Procession. 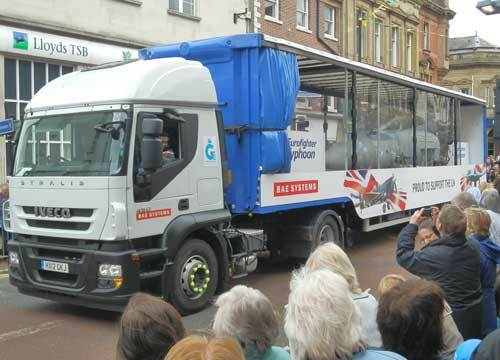 Another display was by local authority services. The British Commercial Vehicle Museum at Leyland brought out their Fire Engine sporting that well known shape of the Leyland radiator grill to those of a certain age. Nice fire engine. 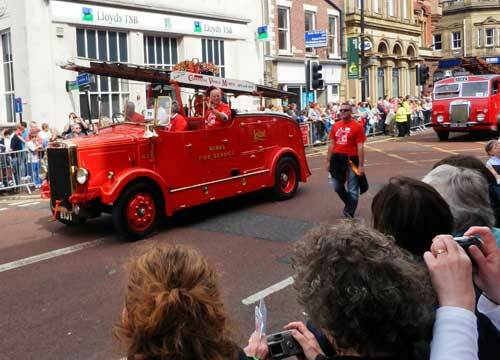 With another following and the modern Fire Brigade at the back. 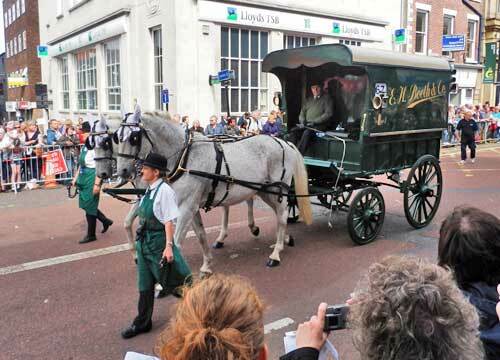 Trotting along was an EH Booth's horse and delivery carriage looking very tidy. Preston based EH Booth & Co have been trading in Preston for over 100 years and sponsor the pleasing clock on the bridge over Glovers Court. Chris Miller another name known well to Prestonians for as long as any can remember. 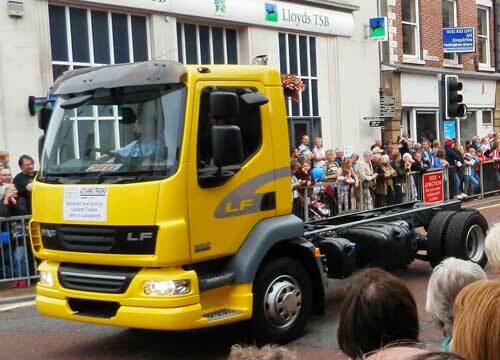 Their heavy haulage trucks long fascinated young boys. Plumbs is another Preston originated company and they put on a big display. If you fancy walking a couple of miles dressed as a chair, step forward for the 2032 Guild. The biggest chair isn't on this photo, it was big. Jopson Bailey Music Academy is new to me but they were making good sounds from their 2 groups of musicians. 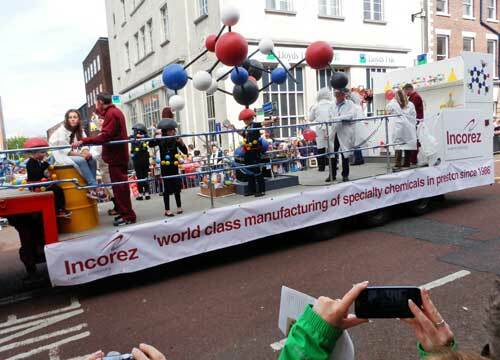 Incorez are another new name to me but anyone who does chemistry gets my admiration. 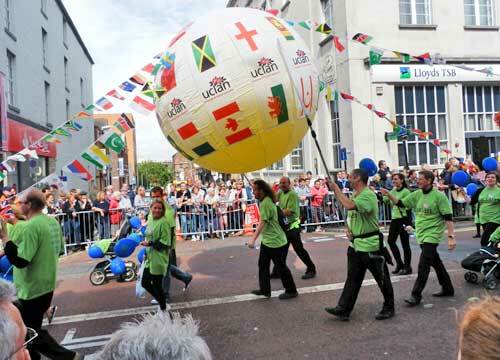 They're in Miller Street and part of Sika of Switzerland who also had a float which is also shown below. 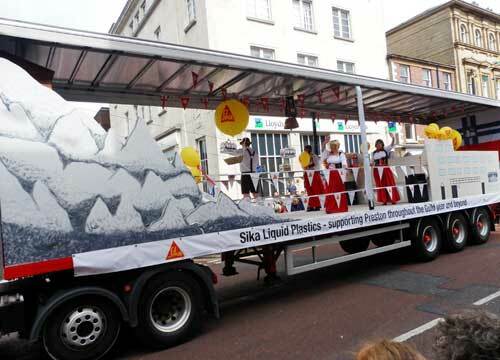 This Sika float is Sika Liquid Plastics, presumably the Liquid Plastics company that has been next to London Road for a long time and started as a Preston company. Need to find out more. 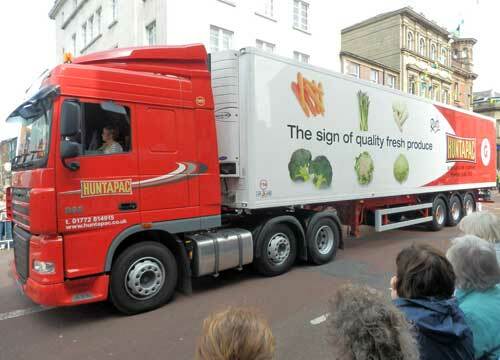 Huntapac: growing, packing and distributing a variety of organic and conventional root vegetables, brassicas and salads. Not sure if to show this as we use another local grower but these have great trucks and we should support locals. University of Central Lancashire now a big force in the middle of Preston. Bringing the vibrancy of youth and supplying qualified workers and maybe entrepreneurs and job creators we'd hope. Over 2 hours of the Trade Procession. 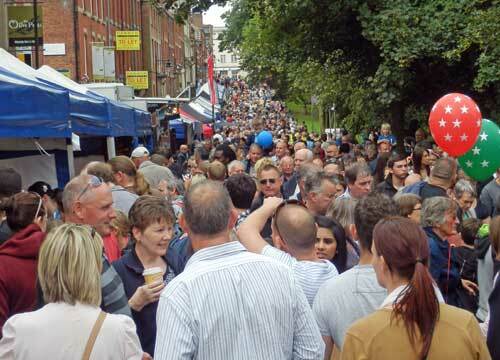 Wander through Winckley Square, wow it was busy with food queues over 20 yards long, luckily we ate earlier. Past the Harris Institute and along Avenham Walk which is a pleasing place. In front of the Belvedere is the view below of the stages where Katherine Jenkins and Jose Carreras, and Human League will sing. 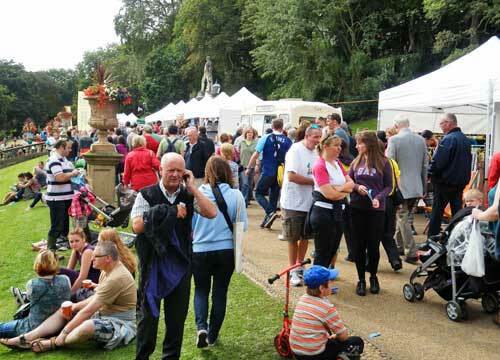 Along the Japanese Garden in Avenham Park, under the Bridge and into Miller Park are a line of Vintage Market stalls and a few foodstalls. The lady selling tea and cake from a vintage VW Camper Van was doing roaring trade next to a vintage Citroen, Pizza stall. 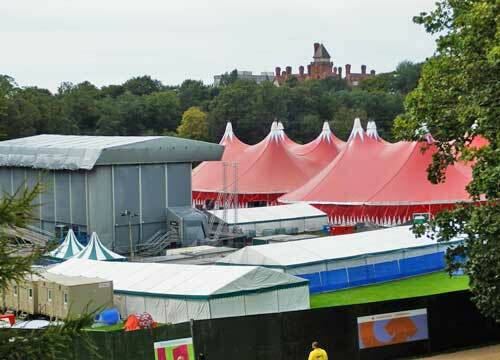 In Miller Park on the Derby Walk is the Queens Jubilee commemorative planting and below is the Spiegel Tent where Vintage Weekend events will take place. 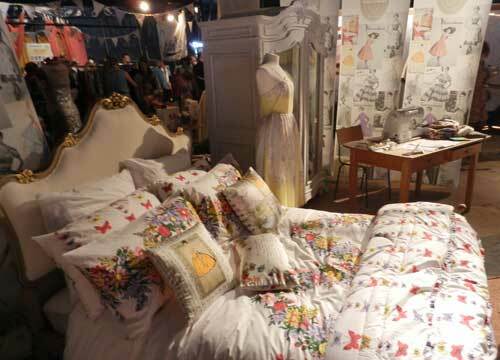 In the craft tent lots of people crafting with material and thread, rooms furnished in an era and this Horrocks display of cotton products. Dress, bedding likely to use cotton made in Preston bearing the famous name of Horrocks, of Preston, known worldwide for quality. 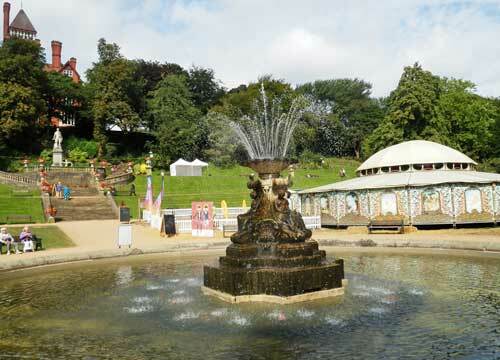 Miller Park looking from the river bank to the old County Hotel and the Earl Derby statue with the Craft Tent on the left, bandstand, vintage car display and vintage market. By now the old pins were giving up so it was off to see if any food at the Square Food Festival could finish the day for us. We decided it was impassable so cut off straight to the station. Great day out. Felt proud to be from Preston. There are another 140 photos and apologies for not showing your float and your costumes after all the work that went into it. That Preston has such a wide range of trade big and small, local, national and international, private and public is quite a tribute. You can come to Preston and find there are people skilled in your business with the education, training and business support you need. The Guild has a lot of business events during the week to show you more. The Deltic Prototype, here for the Guild, at the Ribble Steam Railway and Discover Preston at the Harris Museum are very worthwhile. View the Guild programme. 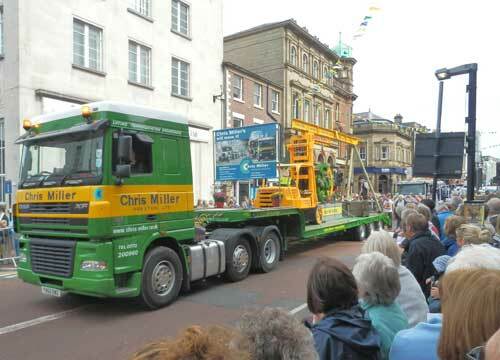 Video by Chris Miller Ltd of their float and its journey in the Trades Procession. Another sunny day. Parked on the bus station and made our way to the Harris Museum for a tour of Discover Preston as part of Heritage Open Days and what else we could fit in out of Archives, Egyptian Balcony Tour. At 10.30 a small group gathered and was ably focused towards a selection of the exhibits by Laura. 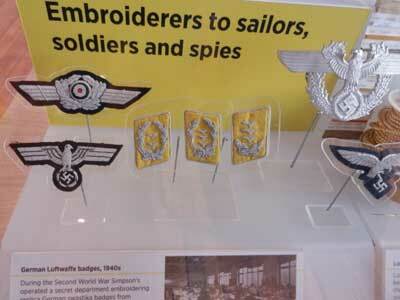 Prison reformer Clay, radical Hunt, inventor Arkwright, teetotaller Livesey, Preston North End, and the gold embroiderers who made Nazi insignia for spies in the war. 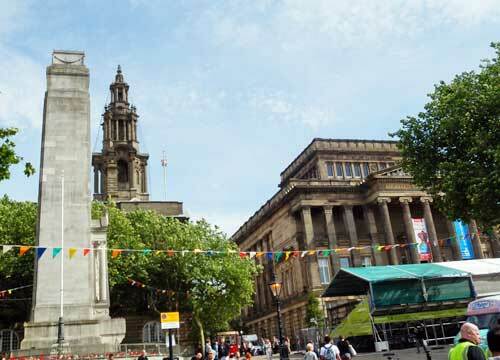 The guide advised there is an Android app showing a history walk through Preston. After the tour we looked around the room. 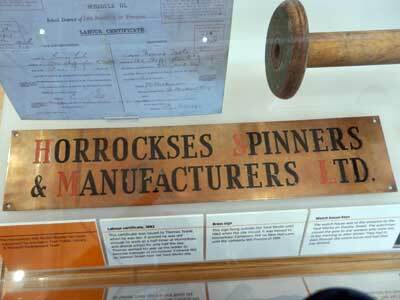 Photo of Horrocks nameplate. 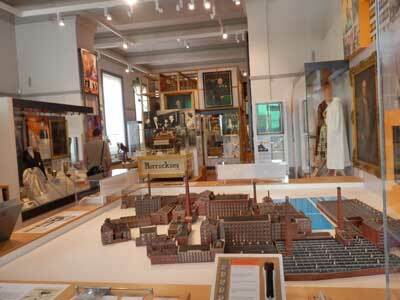 The model of the Horrocks mills in Preston, Horrocks fashions, Preston Park School Grammar for Girls, and a photo along the length of the gallery. 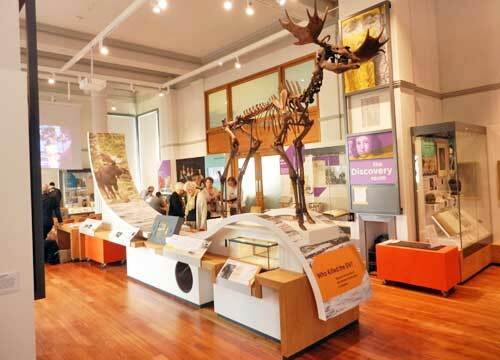 Pride of place in the Discover Preston gallery is the ancient Poulton Elk. 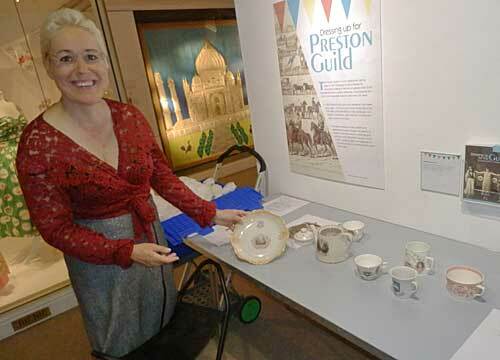 A display of Guild clothing in another gallery had Guild pottery nicely shown by Susan. We have a page on the Harris Museum click here. Quite a lot going on around the centre of Preston. We bought a Preston Guild pint beer pot on Avenham Park. Miller Park had trade tents but here is a view of the Sika Spiegel Tent from the fountain. 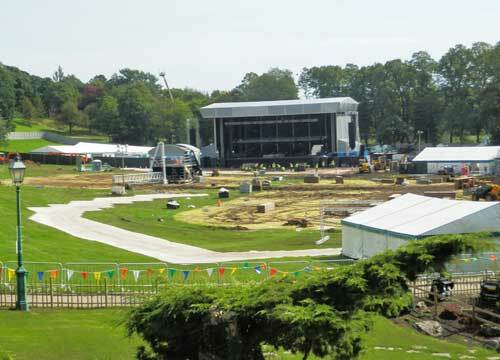 Getting the stage ready for Katherine Jenkins and Jose Carreras on Friday 7th September. 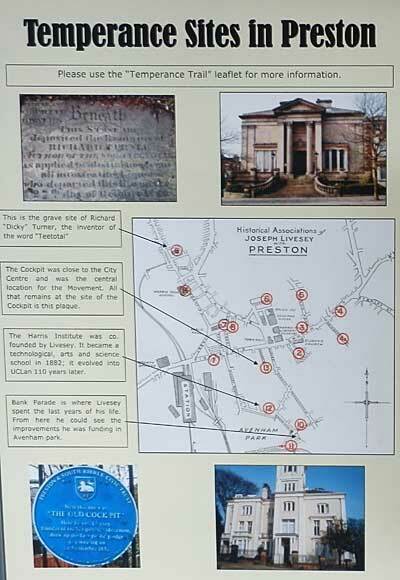 Around Preston are various exhibits. 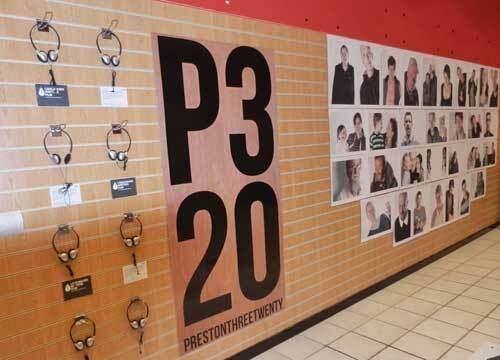 Upstairs in St Georges shopping centre is the P3 20 display: Preston 3 artists every 20 years. Featuring Foxton homeless, Preston futures and some past. Also upstairs in the central area is a large set of Temperance Displays by UCLAN. Preston being the origin of the Teetotallers. There was a special heritage display on the corner of Fishergate and Corporation Street that we forgot about. Walking back to the bus station car park past the Cenotaph, the Harris Museum and Art Gallery and Town Hall. 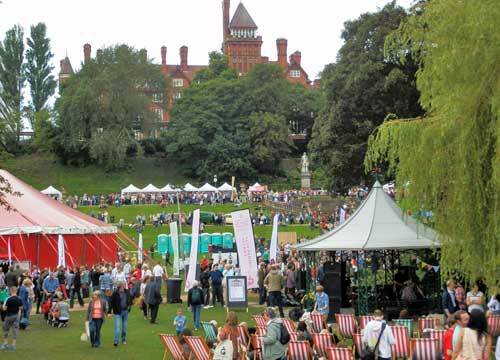 Another successful day at Preston Guild 2012.